David Orr, an Austin community activist involved with transportation issues, is a longtime environmental justice and transportation advocate. Last year, during Austin’s prolonged community debate over the $720 million mainly roads-focused “Go Big” bond measure, supporters of an urban rail starer line in the Guadalupe-Lamar corridor rallied behind a plan put forward by the Central Austin Community Development Corporation (CACDC). 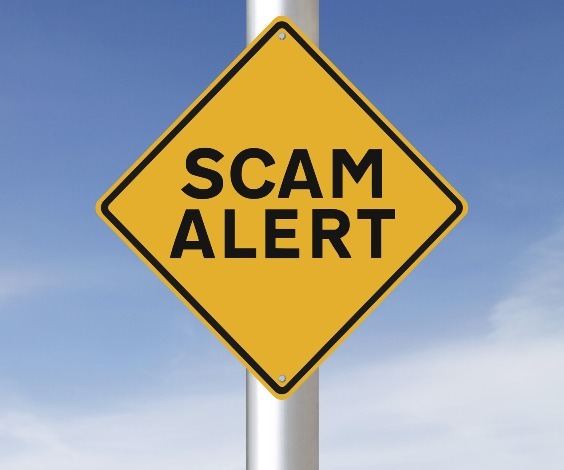 Unfortunately, Mayor Steve Adler (together with several city council members) insisted that the community wasn’t “ready” for such a plan – so a rail vote would have to wait. Many in the community are now wondering: Is there a current initiative to get rail back on the ballot? Judging from recent events and statements by leading public officials, leadership for rail continues to appear close to nonexistent. Take for example, the “workshop” at the Bullock Museum on Saturday March 4th sponsored by the reincarnated Project Connect and billed as a “Traffic Jam”. Supposedly a kickoff for a new planning process for “high capacity transit” systems, this event (which turned out to be a sort of “bait & switch” escapade) featured a panel consisting of Mayor Adler, Senator Kirk Watson, Rep. Celia Israel, Capital Metro Board chairman Wade Cooper, and CAMPO (Capital Area Metropolitan Planning Organization) Executive Committee member Terry Mitchell. At no time was “high capacity transit” even mentioned, let alone covered in any substantive way. The happy talk was all about how hard they worked at the legislature and all the compromises they gladly made only to see their efforts come to naught. The only specific comment Rep. Israel made was that we shouldn’t let the “perfect be the enemy of the good”, presumably by pushing high capacity transit, and that “tires” were what sells to local governments. As opposed to … rails? Watson & Co. were all smiles about the more than $700 million allocated for facilities for cars – but no mention of funding for transit at all, except that it would be very difficult to get and it would be sought only at some point in the future. 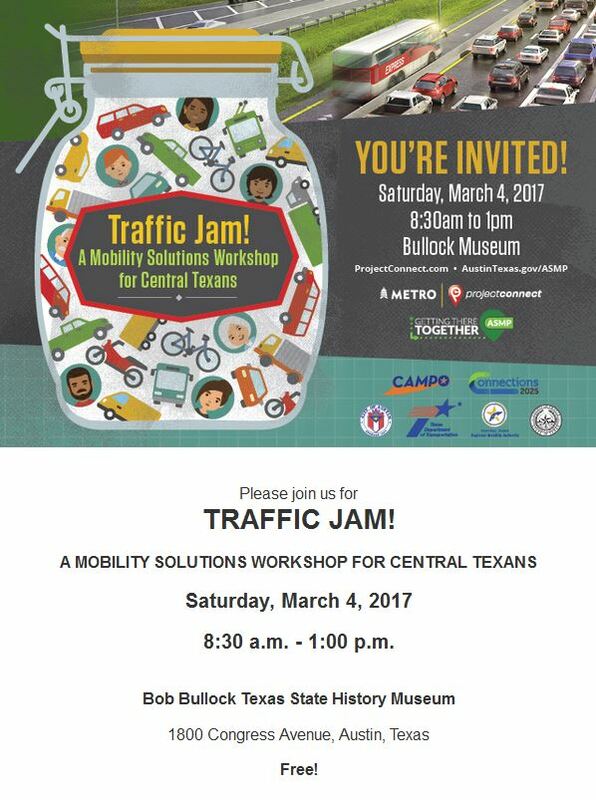 Promotional notice for “Traffic Jam” event at Bullock Museum, 4 March 2017. Given this latest iteration of Project Connect, especially as revealed in this recent workshop at the Bullock Museum, I’d say that a rail ballot issue is farthest from the minds of Steve Adler as well as Celia Israel and Kirk Watson, all of whom spoke at some length on the virtues of more “tires” (as Israel put it)​ and of their pride and excitement at moving forward with road building following the bond passage last November. Never mind that this meeting was supposed to be about planning for “high capacity transit” – there was near-ZERO discussion by these elected officials of any desire for, much less commitment to, building up Capital Metro infrastructure. Also on the stage, as noted above, were members of CapMetro’s board and of CAMPO’s board. The closest any of them came to discussing “high capacity transit” was to bemoan the lack of funding, as if to pre-empt any further talk of building high capacity transit – unless “you” (apparently meaning we the people in the audience and/or those in the general public at large who care about the matter) can find the big bucks required to do anything. The only mention of expanding CapMetro service was Rep. Israel’s expressed desire to expand into Pflugerville, but this was in the context of her expressing that city’s desire to see service in their city. Her comment about “tires” was made in response to a point she was making about satisfying the demands of Pflugerville city council for action to implement fixed-route service. There were vague references to expanding farther, but they carefully avoided mentioning any other currently unserved/underserved outlying cities or counties, involving either urban or rural areas. The only mention of actual plans for improved service was their agreement with CTRMA (Central Texas Regional Mobility Authority, primarily a tollroad development agency) for allowing buses to use the high-occupancy/tolled “Lexus lanes” on Mopac (i.e., Loop 1, as well as perhaps on the TBA expanded I-35). Speakers touted their hard-bargaining negotiation with CTRMA, carefully couched in terms that made CTRMA look magnanimous rather than cold-hearted. So to answer directly that question from the first paragraph, as posed by many in the community: I have huge skepticism whether Mayor Adler would ever commit to supporting rail. “BRT” perhaps, but I’d be surprised by even that. You are currently browsing the _______________Austin Rail Now blog archives for March, 2017.